After deciding to buy a plug-in electric vehicle, often the next decision is to purchase a Level 2 charging station for faster charging at home. The technical name as defined in the National Electric Code for these products is EVSE (Electric Vehicle Supply Equipment), commonly called charging stations. Safety might not be the first consideration when selecting a charging station, but safety is actually the most important thing to consider. The primary function of a plug-in vehicle charging station is to provide electrical safety for the operator and electrical infrastructure throughout the charging process and specifically to address the risks of fire and electric shock. A standard home charging station, whether it is a Level 1 (120V) station or a Level 2 (240V) station, will provide pass through AC power from the power grid and a safety earth ground to the vehicle for charging. The vehicle converts this AC power to DC power and uses that to recharge the batteries. 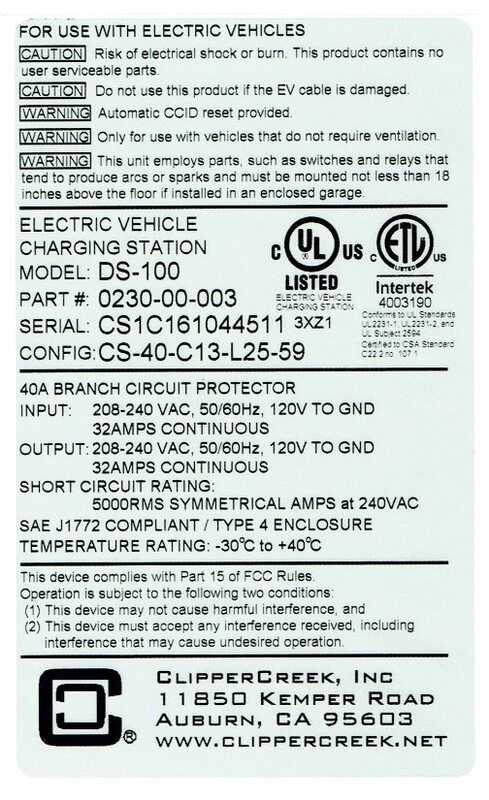 Though the actual “battery charger” is on the vehicle, an EVSE “charging station” implements several layers of redundant safety features to protect the user from potential electrical and fire hazards while connecting, disconnecting, and charging the vehicle. Once connected to the vehicle, the station informs the vehicle that power is available and at what level. The vehicle then takes over, initiates and takes full control of the power transfer. If an electrical fault occurs the station will stop the power transfer immediately and de-energize the cable. The good news is, charging an electric vehicle is actually very safe and easy when done with proper, independently safety certified equipment. The challenge is that not ALL charging stations on the market are independently safety tested and certified. 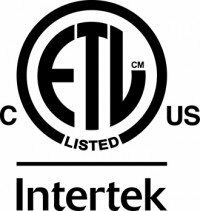 When a charging station manufacturer develops a new product, or makes even a minor change to an existing product, they should send samples to a Nationally Recognized Testing Laboratory, such as Intertek (ETL mark) or Underwriter’s Laboratory (UL mark). Safety engineers at these labs perform months of extensive safety testing that the products must pass before they can be safety certified and made available to the public for sale. Only products with these marks appearing on the manufactured product’s rating plate are safety certified. EVSE manufacturers invest heavily in this third party safety testing. The laboratory safety engineers test the products against thousands of applicable electrical codes and safety standards. Intertek and Underwriter’s Laboratory are the most common NRTLs in North America that can test and certify electric vehicle charging stations. For more information, click here. After passing all the testing and getting a product safety certified the charging station manufacturer’s factory is then randomly inspected four times a year by the National Recognized Testing Laboratory (NRTL) that did the testing and issued the certification. The NRTL field inspection staff ensures the products being sold are constructed in the same manner as the samples that were tested. Changes cannot be made to the products without going back through the certification process. All this testing, independent validation, and facility inspection is completed and the right to apply the marks are given by the NRTLs before the products are sold for people to use. The National Electric Code (NEC) comes from the National Fire Protection Agency. These are the standards to which buildings and equipment must meet minimum regulatory safety requirements in order to be safe enough for the general public to install and use. The NEC absolutely requires any charging station to be NRTL certified in order to be installed anywhere in the US. This is also the case for the CEC or Canadian Electric Code in Canada. In most places, installing an EVSE requires a building permit. One reason for a permit is to provide the opportunity for a building inspector to verify that the charging station is NRTL listed and that the electrical installation meets all other applicable aspects of the NEC and therefore the equipment is safe to use. These standards and practices exist to protect public welfare. It is common practice for all electrical appliances. EVSEs are very high power energy transfer equipment operated daily by the home owner and should be handled accordingly. A consumer needs to look for the official marks from a Nationally Recognized Testing Laboratory symbols (ETL or UL) ON the product itself. These marks cannot be put on the product unless the product has passed the rigorous testing of a certified third-party NRTL and the manufacturer consistently passes the random factory inspections. The NRTL mark has to appear ON the products – not on a website, or a vague statement in a manual or product specification. The local building inspector will ONLY approve a charging station installation if the certification mark is visible ON the product. The marks will appear on a certified product’s name plate, also called the rating plate. 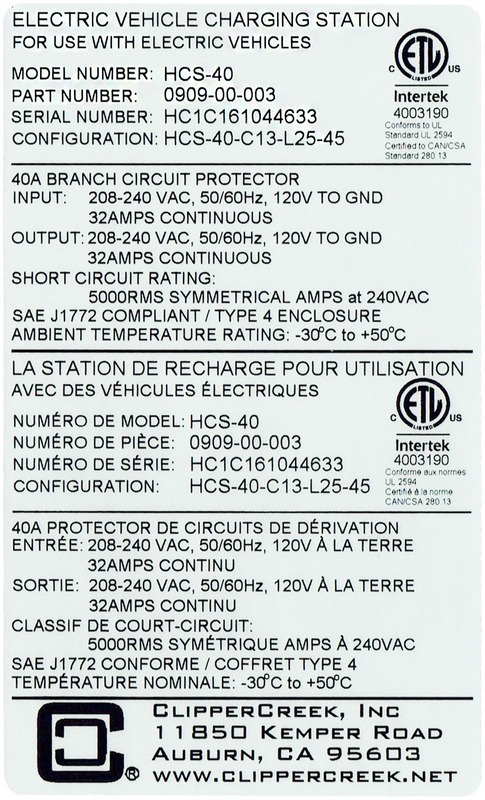 This is actually a durable marking that holds specific information required by the NEC and NRTL Safety Standards including the power and voltage ratings, the manufacturer of origin, part numbers, warnings, and, of course, the ever-important Certification Mark. Look for this plate on the product. If it is not there and the correct certification marks are not present, do not install the product. The building inspector will look for this plate to make sure the product has been installed according to its certification. These rating plates are common on all electrical appliances. Some manufacturers use official-looking marks that are deceptive. A common mark is a CE logo. If you only see a CE mark then the product has not been independently certified. 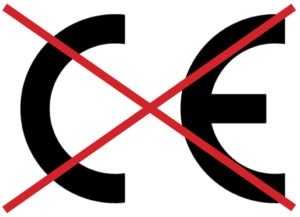 CE is a self-certifying mark; it is not the mark of a Nationally Recognized Testing Laboratory, and it should not be trusted in the US, Canada, and Mexico. A CE mark in addition to the UL or ETL mark is acceptable. Underwriters Laboratory and Intertek both have online resources that allow the public and the building inspectors to verify the marks applied to product are not counterfeit. Public safety is serious business. Do NOT use a product that only has a CE mark. Buying the product from what SEEMS to be a reputable seller doesn’t mean the charging station has been safety certified. Most large home improvement retailer stores like Lowes and Home Depot would likely never carry any electrical item or appliance in their store that was not NRTL certified appropriately. However, there are online retailers, such as Amazon, direct sellers, and sources from outside the United States that DO carry and sell unlisted products. Be cautious of advertising statements such as “built to UL/ETL/NRTL standards,” or “built with UL/ETL/NRTL listed components.” Typically, products that have been NRTL certified will indicate such clearly in their advertising materials and specifications with specific terms like “UL/ETL/ NRTL listed,” or “Certifications: UL/ETL/NRTL.” When selecting a charging station, if you are unsure about the NRTL certification status of a product, reach out to the product supplier and ask them to provide confirmation that the product you are interested in is NRTL (UL or ETL) certified. The charging station manufacturer or supplier should be able to easily reference you to an online directory where you can confirm the up to date certification. When you receive the product, look for the NRTL certification mark on the rating plate. If it is not on the product, do not use it and return to the seller. If you are purchasing a plug-in charging station, don’t ever buy a station with a NEMA 10-30 or 10-50 plug. 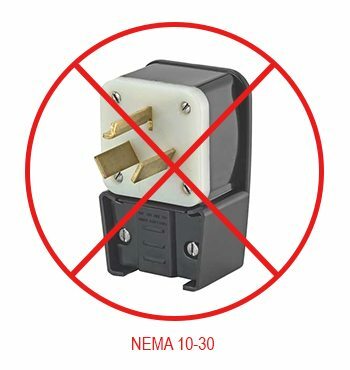 The NEMA 10-30 and NEMA 10-50 style outlets do not have an earth ground connection. There is no possibility that a charging station delivered with one of these plugs is properly NRTL safety certified. One of the key safety functions of a charging station is providing an earth ground connection to the vehicle. This assures the vehicle body is safely grounded during charging. Charging stations must have a connection to earth ground! 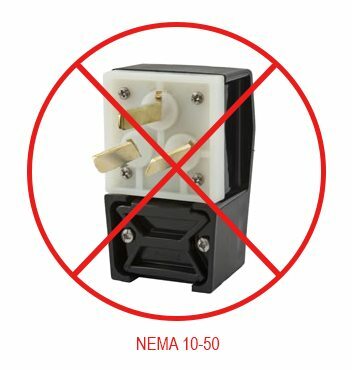 Do not ever use a charging station with a NEMA 10-30 or NEMA 10-50 plug. The station above has a NEMA 10-30 plug. It has no safety ground. 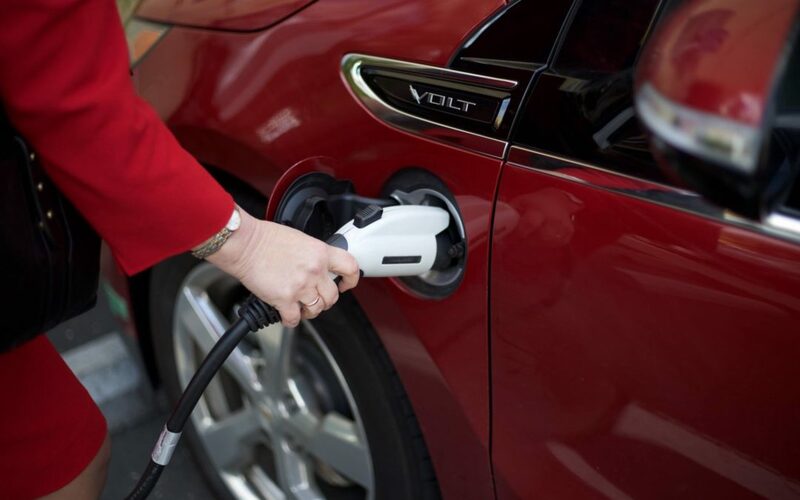 Charging your electric vehicle can be safe and easy, but don’t take chances. Select a safety certified station! Just as you wouldn’t drive a car that wasn’t crash tested, don’t charge your car with a charging station that hasn’t been tested by an NRTL with an active right to apply the mark status. Remember to look for the ETL or UL certification marks when shopping for a charging station. Do you want to know more about Staying Safe? Watch our short video and share it with someone who might not know the importance of safety certification.